It's a celebration of the Year of the Rooster in Chinatown Park. By Spencer Buell·	 1/27/2017, 5:48 p.m.
Photo via New American Public Art. The Year of the Plastic Rooster is upon us. 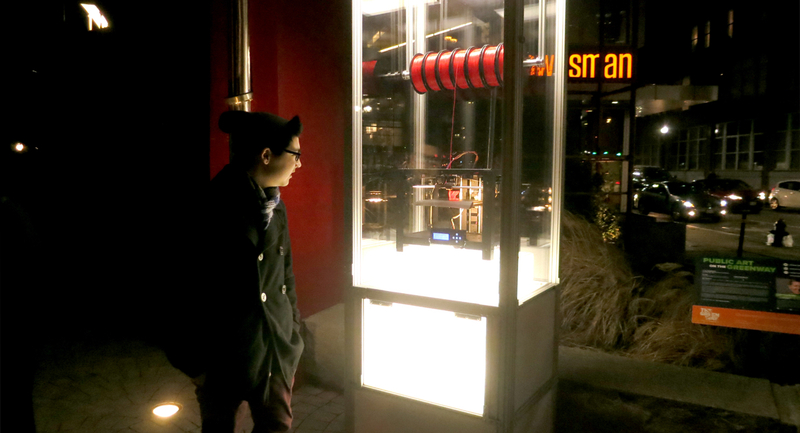 To kick off the Chinese New Year, the Rose Kennedy Greenway announced today it’s debuting an art exhibit-slash-vending machine that will, they say, spit out more than 2,000 3D-printed plastic roosters, day and night, for the next year. Dreamed up by artist Chris Templeman of Somerville’s Artisans Asylum and dubbed Make and Take, it’s made up of an eight feet tall, see-through polycarbonate case with a printer inside. The machine melts and forms plastic thread into the computer-programmed shape (the design comes from a 3D scan of a Chinese porcelain figurine from the Museum of Fine Arts). And when the birds are finished printing, they pop out the bottom for lucky passersby to take home. It’s been whirring away in Chinatown Park for about a week now, dispensing palm-size birds about every 3-4 hours. If you want one of your own, you’ll have to get there at just the right time, before someone else snatches it. According to the Chinese calendar, the Year of the Rooster begins on Saturday. If you visit the artwork, Templeman hopes you’ll take a moment to think about “the democratization of manufacturing,” according to a description on the Greenway’s website. And n addition to being pretty cool, they say the year-round project is an unprecedented use of the emerging 3D-printing technology, made possible by the weather-resistant shell produced by Somerville’s New American Public Art, which they hope will keep it going nonstop all year.